Inclusions: the Services of your private, expert Paris tour guide and taxes. Optional: These private Montmartre tours can also included private transportation. 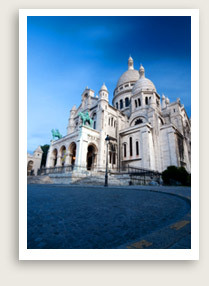 NOTE: These private Montmartre tours in Paris can be fully customized to meet your goals. Montmartre sits on a hill, la butte, on the right bank of Paris’ 18th arrondissement. Montmartre’s name, which means ‘mountain of the martyr’, derived from an incidence that took place on this very site, the beheading of the patron saint of France, Saint Denis. Montmartre has a colorful history and the 19th century contributed to its unique and charming character seen today. For your private Montmartre tour in Paris, your guide will meet you at your hotel and head to the Sacré Coeur for a guided visit of this famous white basilica overlooking Paris. Your Montmartre private tour will take you on a walk along the narrow streets of this artistic neighborhood, you will discover the last vineyards of Montmartre; stop at the café “Le Lapin Agile,” frequented by many famous artists; have a look at the last windmills of Paris; walk to the Bateau Lavoir, where Picasso and Modigliani had studios; and finish at the Place du Tertre where you can admire the local painters’ newest creations or have your portrait drawn.